My name is Marshall Smithson. Not being raised in a Christian home, I grew up with no knowledge of the Scriptures or the Gospel. At the age of 18, I was confronted with the reality of my sin and with the saving power of the Gospel. I was converted and began attending a small local church in the suburbs of Dallas, Texas. This was in 1975 shortly after graduating from high school. One year later, I met and married my wife, Karen. We have now been married for over 37 years. We have 3 grown children and 10 grandchildren. I soon felt that the Lord would have us pursue a life of ministry. So, in 1980 we packed up and moved to Montana. There I attended Big Sky Bible College and graduated in 1983. The Lord has allowed us to serve in various ministries in Montana, Alaska and Arkansas. Most of these ministries have been bi-vocational. I have been in the floor covering business by trade. Over the last 15 years, I have had the opportunity to participate in short term mission trips to Ecuador, Guatemala, Russia, Ukraine, Belarus and Nepal. Since 2007, I have had the opportunity to travel annually to Myanmar (Burma) working with different churches and seminaries. I invite you come visit us at Little Red River Bible Church..
My Name is Tony Floyd. I grew up in Pangburn, and currently live a stone's throw away from the house my father was born in. The Floyds have been in this area since the second half of the 1800's. My roots run deep in the Pangburn area. I have been in business in the area for 23 years and have had an unquenchable desire to preach for the last several years. I wrestled with and determined that I was willing to dig up the roots and go wherever God would lead. After supply preaching in several area churches and a lot of time praying, I have concluded that God wants me here in Pangburn. Considering my love for Pangburn, it is my desire to spend the rest of my days serving the community by working at making disciples, seeing lives transformed by the Gospel. My prayer is that Little Red River Bible Church will be a blessing for this community. I was ordained and served as an Elder in Foothills Bible Church for 3 years. I grew up in, was baptized by, and was licensed to preach by Pangburn First Baptist Church. I received a BA in Business Administration from Ouachita Baptist University (1994), and have been pursuing a Masters degree in theology the last few years, doing course work at Heber Springs Theological Seminary, Knox Theological Seminary, and Southern Baptist Theological seminary. Lord willing, one day I will finish, but really enjoy growing in the knowledge of the glory of God. I married my beautiful wife, DeSonya, in 1994, and have been blessed by God with 4 children. 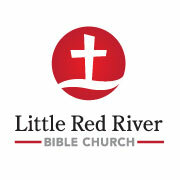 I invite you to come visit us at Little Red River Bible Church. May we glorify God and enjoy him forever.